The grand prize winner of the first annual EAA Founder’s Innovation Prize explains his concept for reducing the number of accidents induced by loss of control. Also, an Airbus autonomous flying vehicle concept, Part 107 regulations for small commercial UAS, a laser pointer goes to prison, a federal lawsuit against United Airlines, pay raises for airline employees, and 787 Dreamliner engine woes. Ihab Awad is the grand prize winner of the first annual EAA Founder’s Innovation Prize for his Airball concept designed to reduce accidents induced by loss of control. Ihab explains how the loss of correct relative wind can result in stalls and spins, and how the Airball graphical representation (a blue ball) allows the pilot to quickly understand and manage the flight state of the airplane. Airball does this using air data from a number of sensors. Ihab is a programmer working at Google in Silicon Valley. He holds Master’s degrees in mechanical engineering and computer and information sciences from the University of Minnesota. 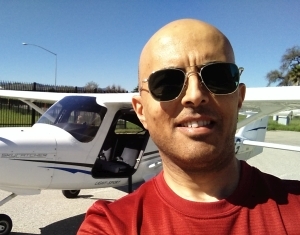 Ihab is a Sport Pilot with 150 hours, and looks forward to building his own experimental aircraft. Follow the project at Airball.aero. Also, find Ihab on Twitter and Facebook. Founder’s Innovation Finalists Forging Forward by Beth E. Stanton describes the five finalists in some detail, with videos. In Airbus Group: Future of urban mobility, My Kind of Flyover, the company says, “By 2030, 60% of the world’s population will live in cities… Airbus Group is harnessing its experience to make the dream of all commuters and travellers come true one day: to fly over traffic jams at the push of a button.” Vahana is the Airbus concept for an autonomous flying vehicle for passengers and cargo. It’s under development at the A3 “innovation outpost” in Silicon Valley. The new small unmanned aircraft rule for non-hobbyists (also known as Part 107 to Title 14 CFR) became effective August 29, 2016. The person flying a drone must have a remote pilot certificate with a small UAS rating, or be directly supervised by someone with that certificate. The UAV Digest, episode 151: Part 107: Operation and Certification of Small Unmanned Aircraft Systems where we provide a summary of the major provisions of Part 107. 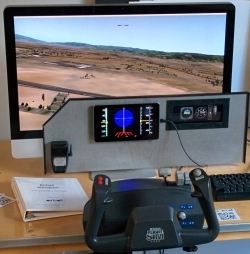 The UAV Digest, episode 159: Taking the FAA Online UAS Training Course where Max Trescott talks about completing the FAA UAS online training course. A 35-year-old California was has been sentenced to 15 months in federal prison for pointing a laser pointer at a police helicopter flying over a traffic accident. The U.S. Department of Justice filed a lawsuit in Chicago federal court claiming that United Airlines failed to provide a pilot with sick leave when he was called to active duty by the U.S. Air Force. The suit charges that the pilot, a reservist, was denied his employment rights and violated the federal Uniformed Services Employment and Reemployment Rights Act (USERRA). After years of concessions, airline employees are starting to benefit from high airline profits. All Nippon Airways (ANA) is seeing sulfidation-corrosion cracking of turbine blades on some of its Boeing 787 Dreamliner jets. All 50 aircraft in the ANA 787 fleet are powered by Rolls-Royce Trent 1000 engines. The OV-10 Bronco, Part 2: Foreign Variants and Civilian Applications. Sometimes history repeats itself. After being moved into the civilian world, the Bronco returned to combat twenty-plus years after it was retired, with only protest from the Marines. 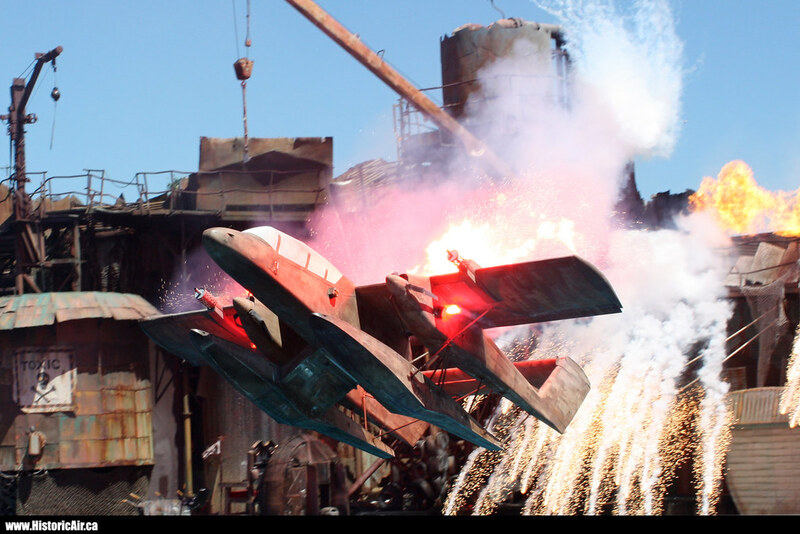 OV-10 mockup with floats at Waterworld exhibit, Universal Studios: Photo 1, Photo 2. Tiira homemade airplane designed and built by Raimo Päätalo. This entry was posted in Episodes and tagged Airbus, B787, EAA, FAA, UAV, United Airlines on August 31, 2016 by maxflight.